I have been living in jeans for the last two years. I used to wear more skirts and dresses but I have been working from home a lot and my current office has a very casual dress code, so denim only seems a natural choice. Plus, its so easy, you slide into a pair of skinny jeans, throw on a floaty top and voila, you are ready to go! Well, good or bad, it was an excuse to shop for something new. So far so good, right? Unfortunately, shopping when you gain weight can be a torture. Everything was just wrong. After trying on 15 dresses I was feeling like a bloated hippo and pretty much ready to give up. Resign myself to the fact that nothing will ever look good simply because I don't. But you know what? I am stubborn. I was convinced there is a dress out there for a woman of any size and proportions, I must have been trying on the wrong styles. So did a quick inventory of what works and what doesn't. My biggest problem area is my waist, or the lack of one. On the other hand, my legs are probably my favorite feature, that's why I have been loving all those skinny jeans. I needed a dress that is fitted on top and flows from my chest skimming over the belly and stops few inches over my knees. It has to be more structured and made from fabric that is not too clingy. I love the color and pattern but nothing beats dark solids when you want to look size smaller than you are. 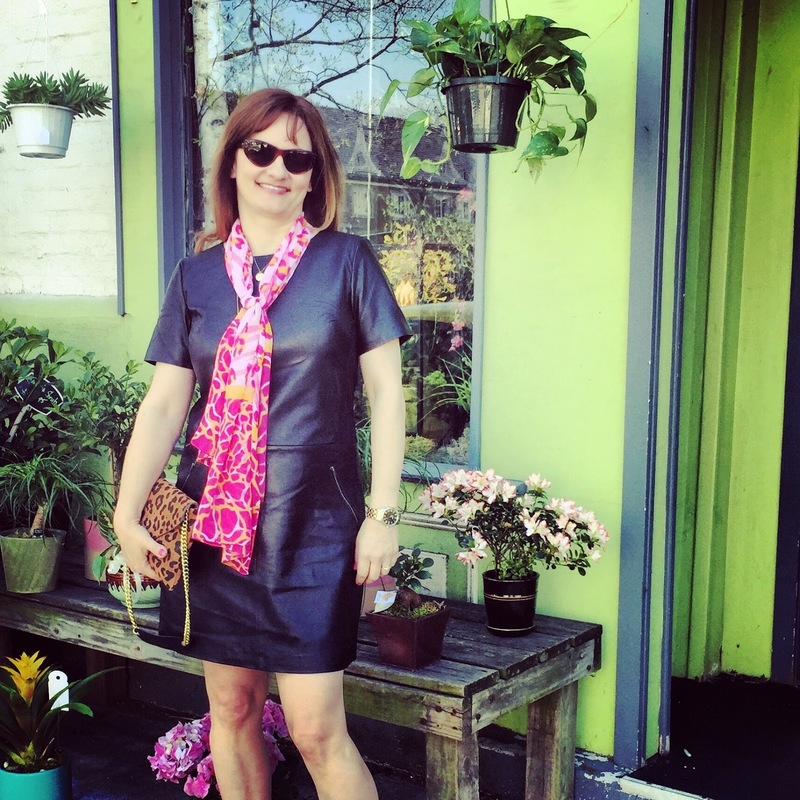 Say yes to the black leather dress! This dress from Halogen ($59.99 at Nordstrom Rack) did not wow me on the hanger but once I put it on it, I felt less of a dancing hippo and more of a rock 'n' roll, what more can you ask? At first I was worrying that this dress is not exactly spring appropriate but nothing than some accessories and hot pink nail polish can't fix. I was hoping for a cooler, cloudy day and of course we got a blast of 80 degrees but you know what? Air conditioning saves the day! What do you think? Do you ever feel like a hippo when shopping for a special occasion dress? Do you believe it is all a matter of choosing the right style and proportions? Love the dress, you look fab, and of course you're right, style and proportion! I would add fit, even something "unfitted" has to hit just right at the shoulders. I am with you in the dress dept. can never find one when I want one. Finding a well fitting dress is as hard as findig a great pair of jeans. You are no hippo. You look fabulous and so so happy! So glad to see that. I agree with A, you are no hippo! That dress looks fantastic on you!! Love the pink scarf too! I love the dress. It is very "you"- unfussy and chic. I love dresses, and I agree, when you find one that fits, scoop it up! Looks absolutely fab on your with the pop of color in shoes and scarf. I have sworn off skirts and dresses until mid summer as too lazy to shave legs plus it never gets really boiling here. I work at home all the time, so would be nice to get job where i could wear something other than pyjamas! Great article, thanks for sharing with us. Keep up the good work!